So delicious together, knotted wood and knotted rope. Part of a people-barrier during the International Barbican Jazz and Blues Festival, Plymouth 2008. You may have noticed that I like to play on words—not very well, maybe, but I try. In this one, there's the half of a knot in the wooden post—not quite a knot, and then the rope knot as well, hence the name—knot a rope knot—geddit? Rope knots have a special meaning for me—I spent a little time in the merchant navy and briefly tied for work and pleasure (monkey's fists, mats, shoe soles, and other decorative ones whose names I forget). I also spent a few years as a caver and at times you've just got to rely on the knots you tie, in a life or death sort of way! 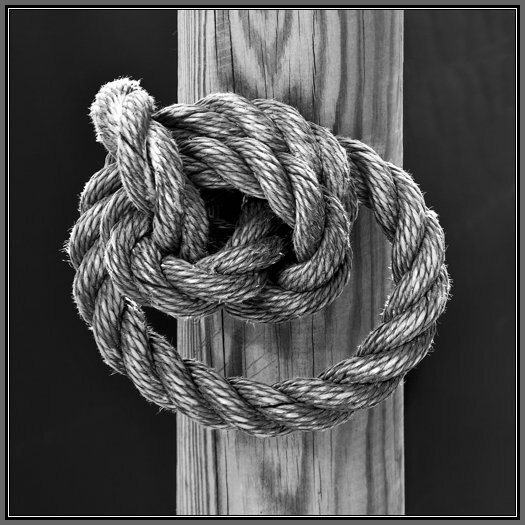 The first thing that attracted my attention about this piece was that of the contrast between the rough textures of the rope against the intense smoothness of the wooden post and the blandness of the fabric background. So much in the way of strong pattern—the intertwining strands of ever smaller strands (Big fleas have little fleas, Upon their backs to bite 'em, And little fleas have lesser fleas, And so ad infinitum) ...the delicious patterns of the grain and the hints of knots in the wood. Oh, and the humour in the two different kinds of knot—oh, how easy I am to please! What a lovely shape that knot of rope makes, winding round and round and in and out—very pleasing. There's also quite a 3d feel, adding to the overall effect.